Special Edition book and choice of original signed print (see below). Roman Loranc introduces a singular vision to the West Coast photographic tradition as he expands its territory. Finding uncommon beauty in the fragile wetlands and ancient oaks of the Central Valley, as well as its rural back roads, hills and farms, Loranc’s exceptional prints make these subjects as memorable as famous views of Yosemite. Born in Easter Europe in 1956 and arriving in California in 1984, Loranc has injected a wealth of cultural tradition and emotion into his beautifully hand crafted photographs. In recent years, Loranc has returned to explore the surviving countryside and architecture of his Polish homeland, including the atmospheric interiors of its churches and synagogues. 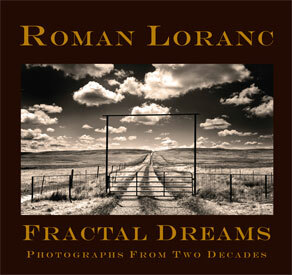 Fractal Dreams presents the first twenty-year retrospective of Loranc’s images from both California and Europe, highlighting the unique lyricism and powerful drama of his bold photographic vision. His widely collected work is featured in museums and private collections an has appeared in numerous publications, including his acclaimed 2003 monograph, Two-Hearted Oak. To order a copy please contact Gemma DeSantos at 713 520 1200.